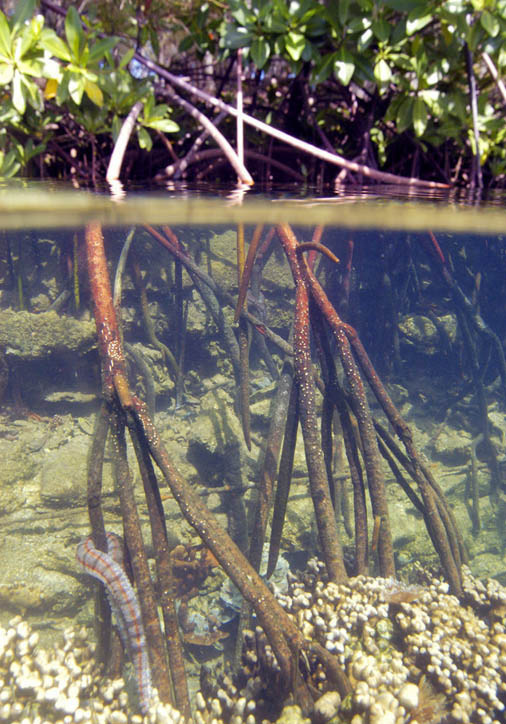 Rhizophora mangle, the Red Mangrove, is probably the best known mangrove of all mangroves and belongs to the "true mangroves". 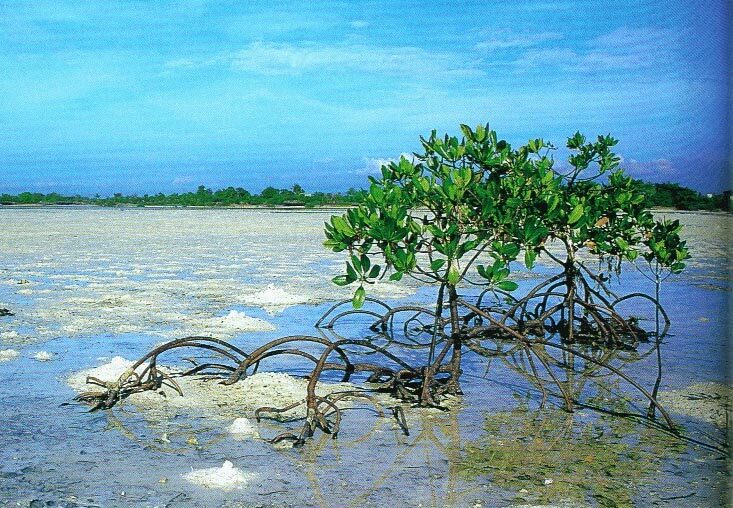 The Red Mangrove is a strong and tough mangrove. Rhizophora mangle is able to grow in different climates a propagule from the tropical zone will grow in South Carolina USA it can handle changing humidity, salinity, air- and watertemperature and the propagule lasts for up to one year floating in the ocean, this characteristis made it able for Rhizophora mangle to colonize huge territories and to compete with other manrove species. 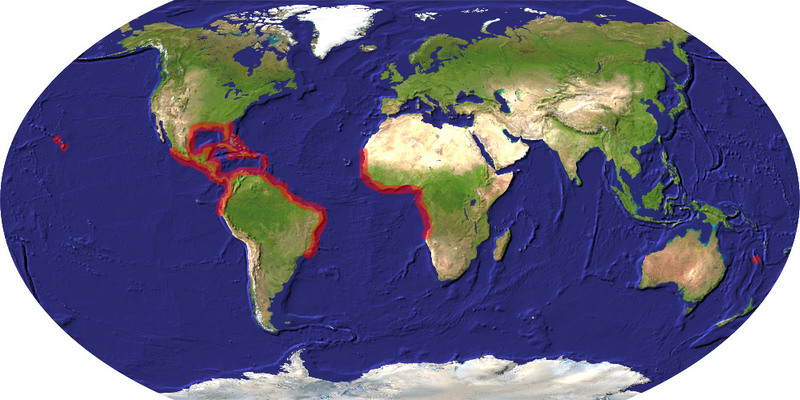 Territories that have been colonized by Rhizophora mangle sometimes drive out existing local mangrove species. 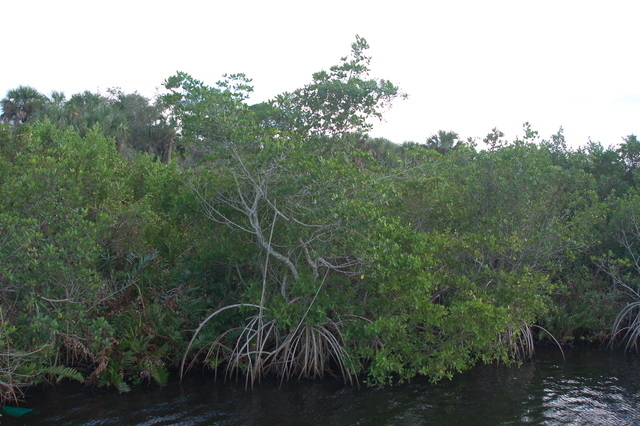 Rhizophora mangle definitely is the most dominant mangrove on our planet. The name Rhizophora mangle is Greek and Spanish. Rhizophora "rhizo" meaning root and "phora" meaning bear or carry in reference to the numerous prop roots growing from the trunk and branches of the mangrove. 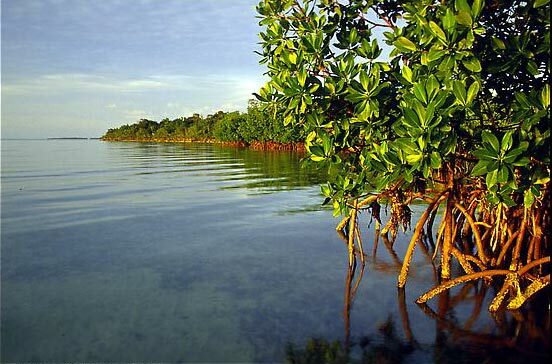 Mangle is Spanish and means mangrove, it is the word for this plant used by the Taino people of the Caribbean Islands. 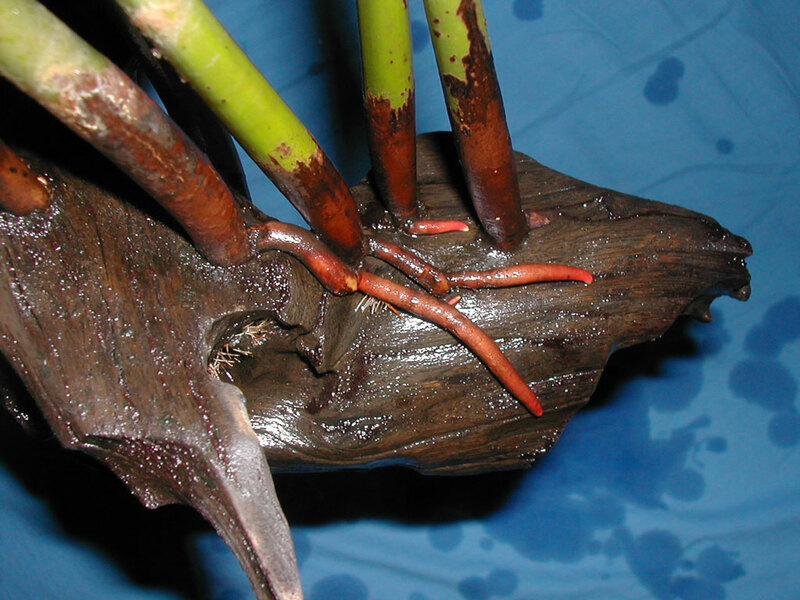 Rhizophora mangle has quite a few common names, the most common one is Red Mangrove, most probably from its stilt roots that often have a reddish coloration. 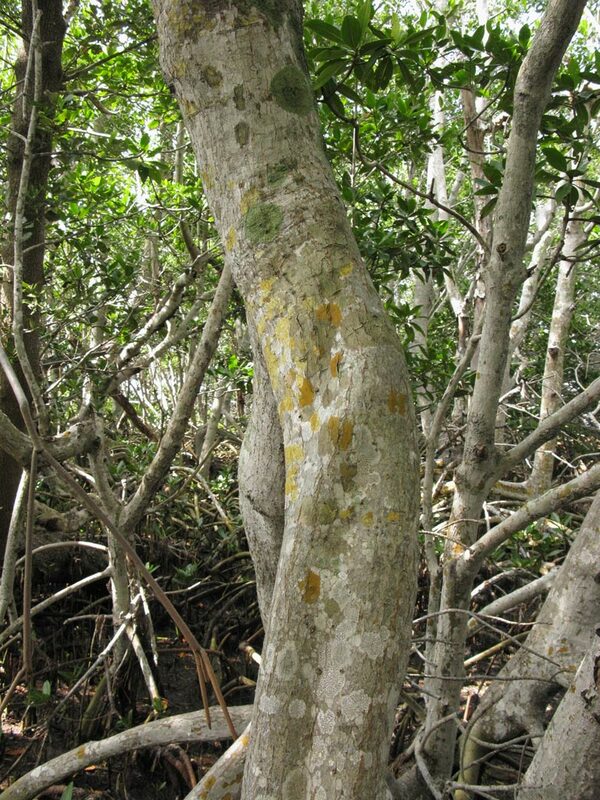 In America Rhizopora mangle is also called American Mangrove in South America Rhizophora mangle has numerous names changing from "apareiba", "mangle dulce", "mangle rojo" to "tiri wai" on the Fiji Islands. 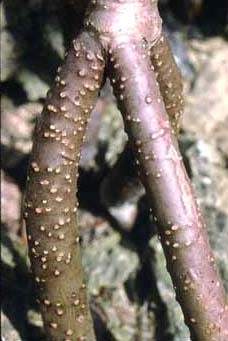 Rhizophora mangle was described for the first time in 1753 by Linnaeus. 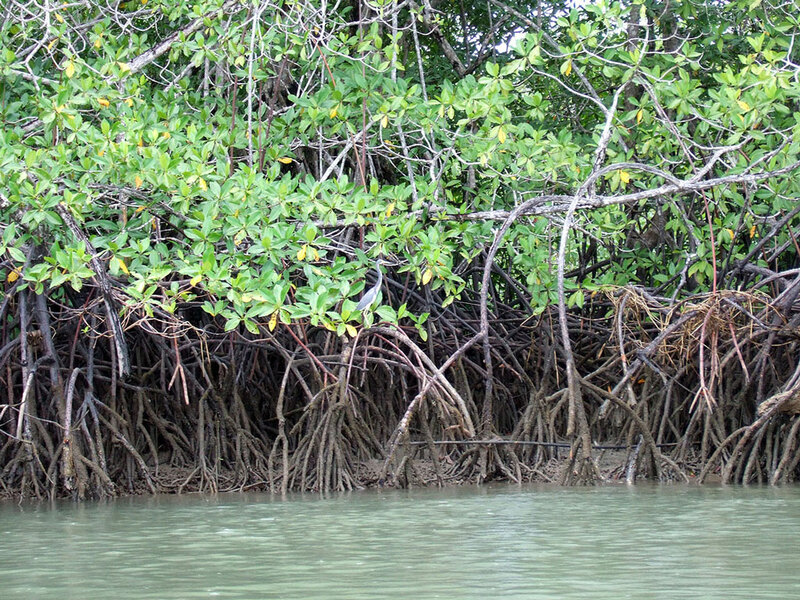 Rhizophora mangle is the most widespread mangrove on our planet and colonized with its adaptability and long-living torpedo seeds many parts of the world. 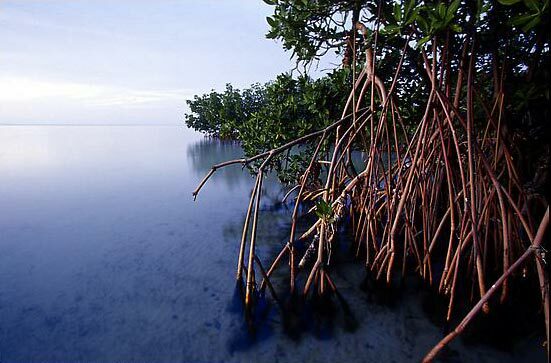 The Red Mangrove was als spread by human for coastal protection and aquaculture. 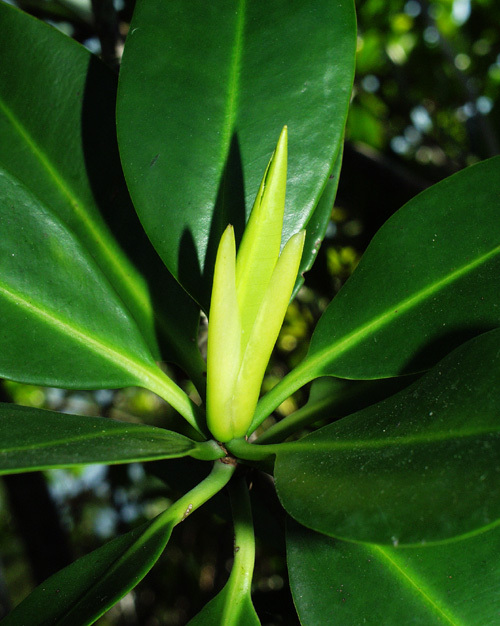 Nowadays Rhizophora mangle grows between latitude 25 north and 35 south from the equator. 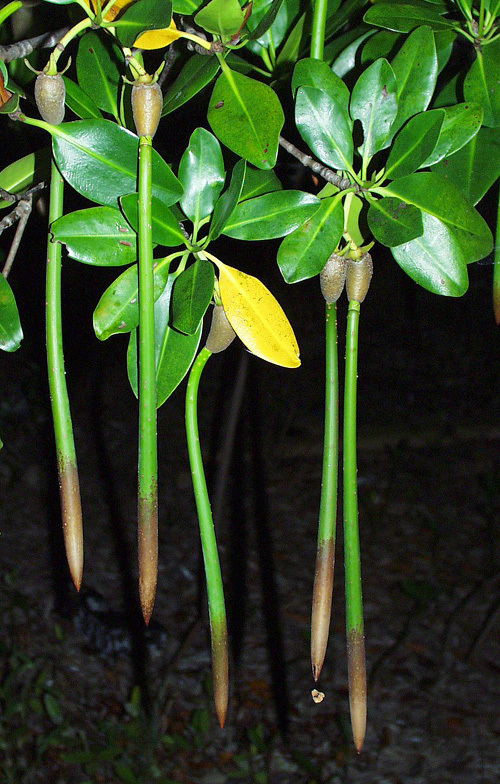 Humans introduced Rhizophora mangle to Hawaii, the United States and Queensland in Australia. 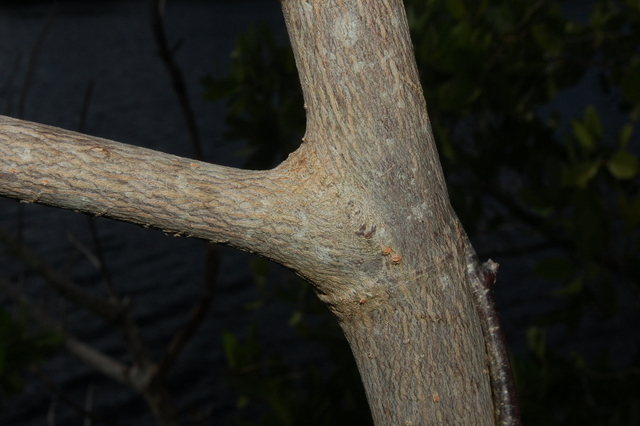 Rhizophora stylosa was known as Red Mangrove for a long time. 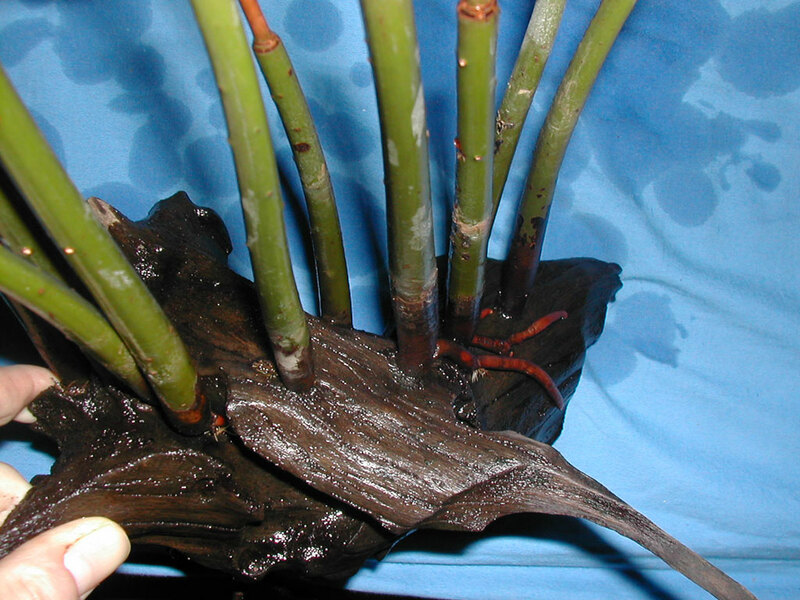 Rhizophora mangle is the most common mangrove formation in the Atlantic and Pacific coasts. Rhizophora mangle can be cultivated easily under simple growing conditions. One of the most important criterium for a successfull long term cultivation of Rhizophora mangle with magnificent growth is to offer the right kind of soil substrate with a numerous amount of the right nutrients. 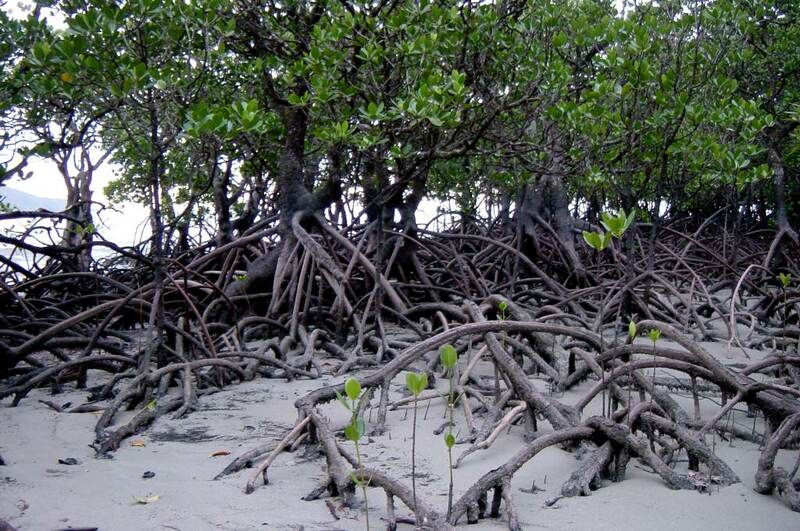 We recommend Mangrove Mud Special with which we have excellent results in growing Rhizophora mangle. 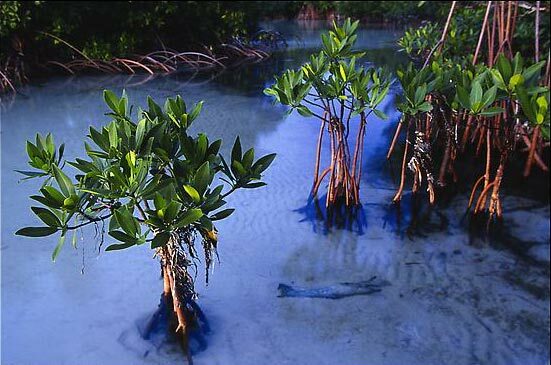 Mangrove Mud Special is a long term fertilizer that can be used pure or stretched with sand. 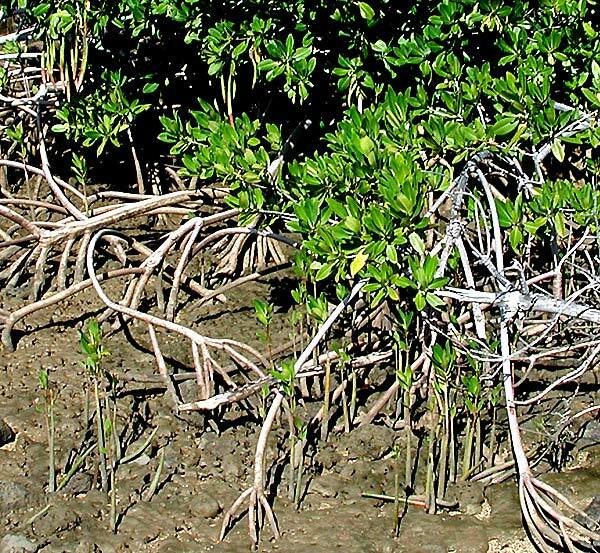 The less stretched Mangrove Mud Special is the more effective it is and the easier it is to cultivate Rhizophora mangle. Air temperature should be around 20 to 30°C. For perfect growth we recommend to grow Rhizophora mangle at 26°C and above. Not at any time the temperature should fall below 10°C. Short temperature drops for a few days down to 15°C are normally no problem and can be handled pretty well. Water temperature should be around 20 to 30°C. For perfect growth we recommend to grow Rhizophora mangle between 25-26°C. Not at any time the temperature should fall below 10°C. Short temperature drops for a few days down to 15°C are normally no problem for Rhizophora mangle and can be handled very well. Humidity should be around a minimum of 50 percent. 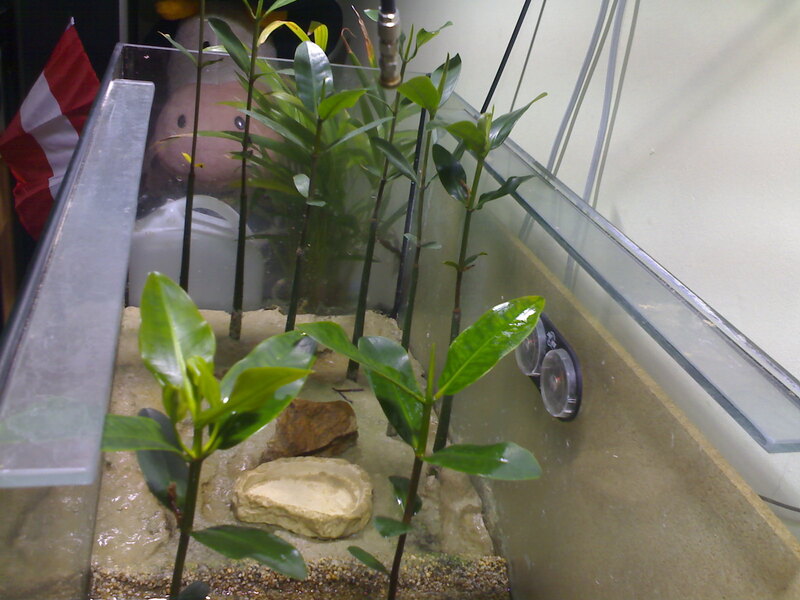 The higher humidity is the better it is for Rhizophora mangle and its growth. In most cases a sprayer hels to increas humidity if too low. Light plays an important role in keeping Rhizophora mangle successfully and is directly related to the growth. Rhizophora mangle can be grown successfully by daylight during the whole year but shows its full glory at a daily light period of 10 to 12 hours. An additional or total illumination by an artificial lighting system is recommended, especially in places outside of the thirtieth latitude. 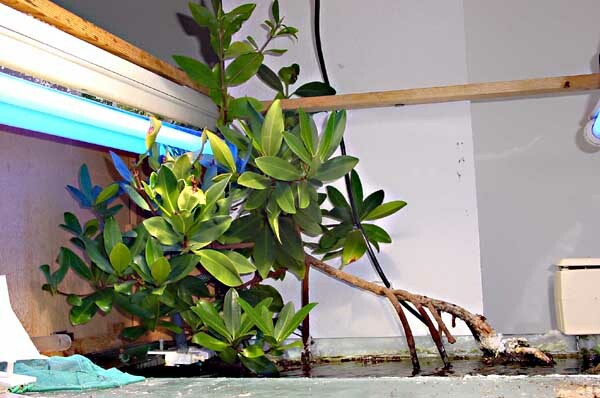 T5 fluorescent lamps also achieved good results in growth of Rhizophora mangle. 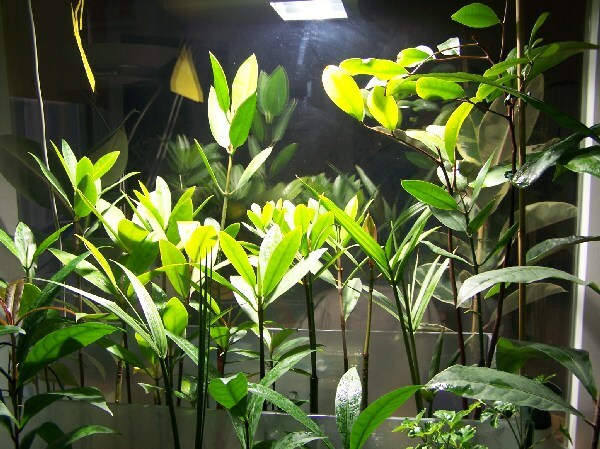 We do not recommend T8 fluorescent lamps or other common plant lamps for Rhizophora mangle. 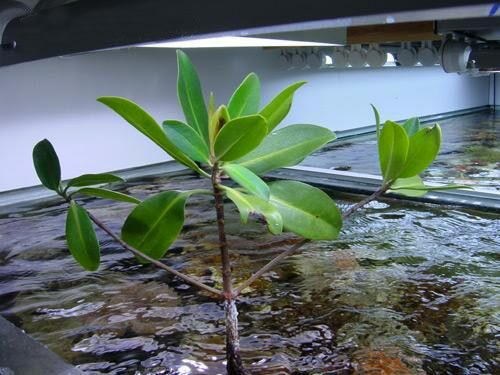 Rhizophora mangle perfectly can be grown in any kind of aquarium whether seawater aquarium, brackish water aquarium or freshwater aquarium. 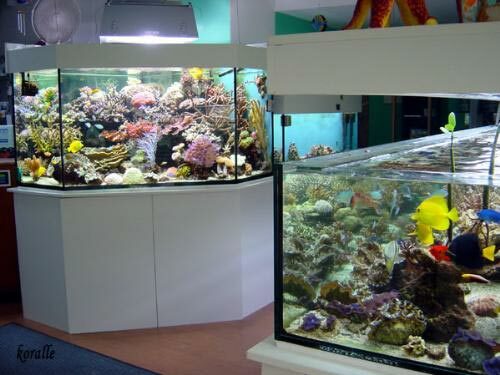 The implementation of Rhizophora mangle into your tank is generally absolutely easy. Rhizophora mangle has rapid growth and filters nirite, nitrate and phosphate pretty good. 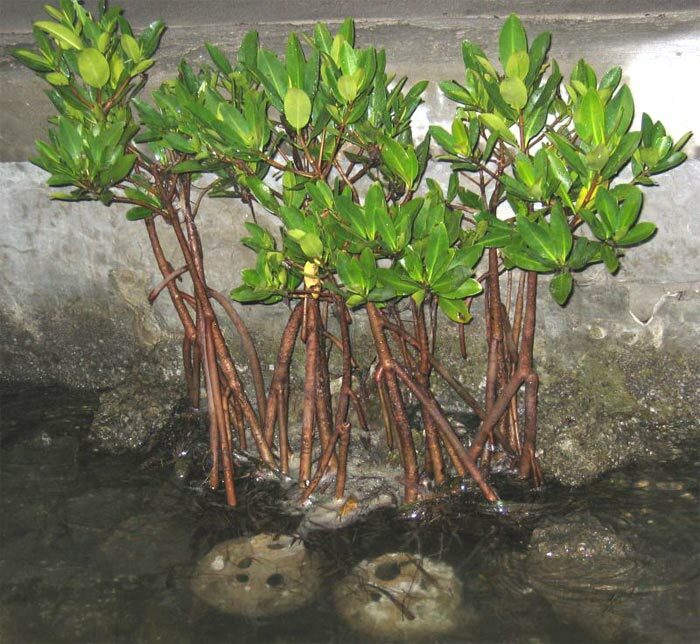 Cultivation of Rhizophora mangle in a mangrove basin is very easy. Socialization with other mangrove species is no problem. 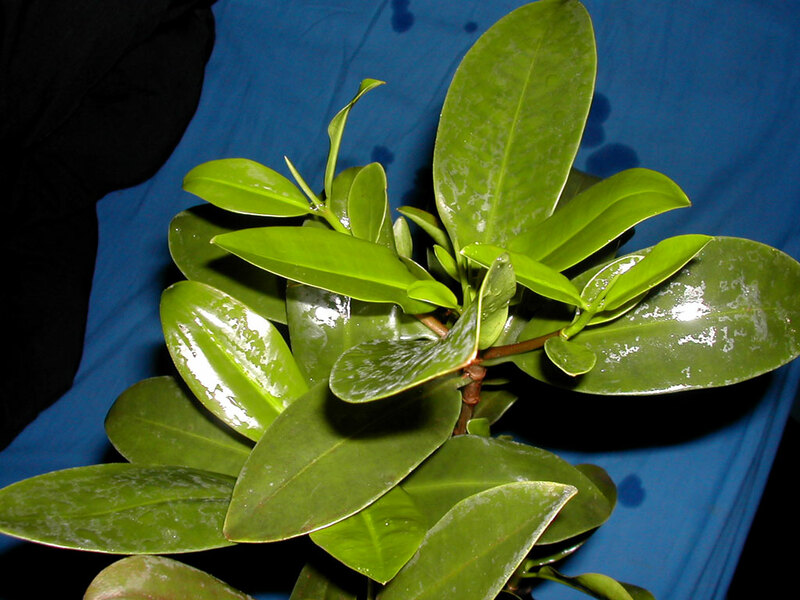 Due to the increased humidity in a vivarium Rhizophora mangle can be grown perfectly in a vivarium. Keep in mind cutting shoots right on time before the plants get too big. 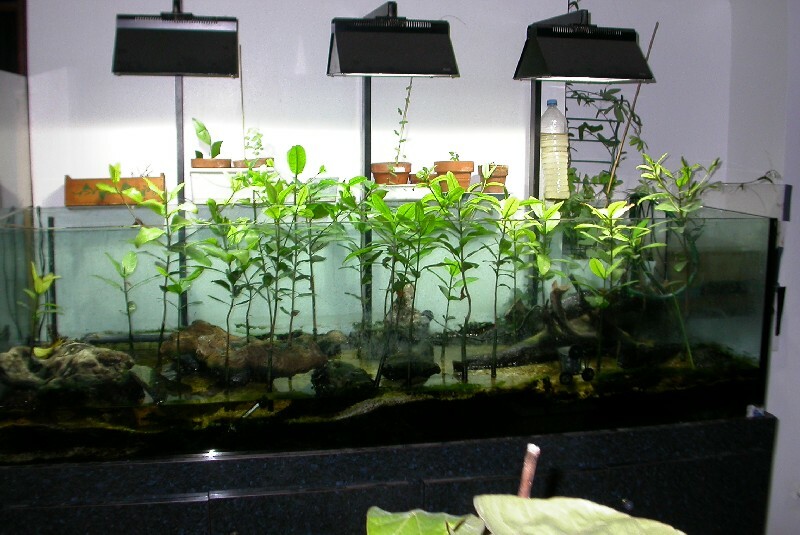 Generally a tropical terrarium offers very good growing conditions for the Red Mangrove. Rhizophora mangle is a great appearance in such a tropical terrarium, especially near or in the water part of the terrarium. The animals of the terrarium will love the variety. Keep in mind cutting shoots right on time before the plants get too big. 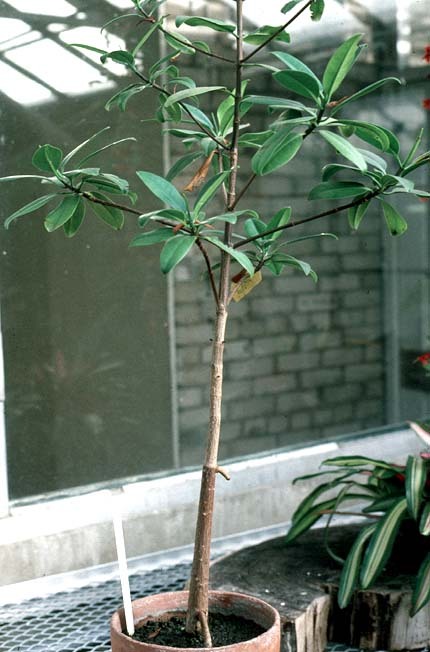 Due the robustness of the Red Mangrove, Rhizophora mangle is one of the few mangrove species that can be grown as an indoor plant on the window sill or in a conservatory. 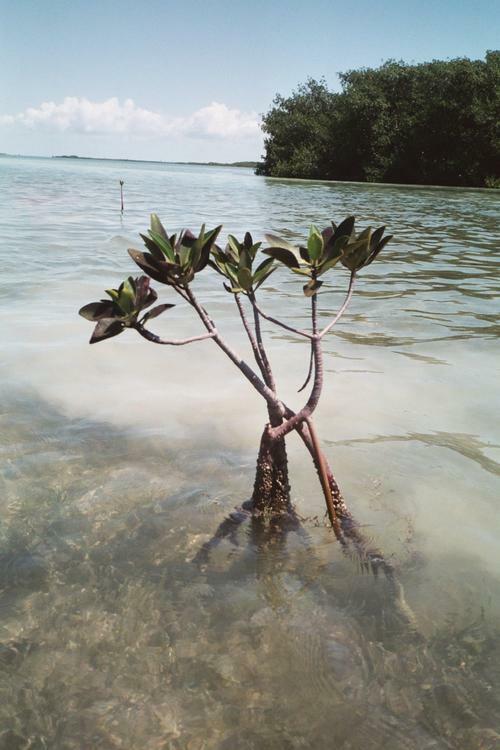 It is important that the Rhizophora mangle is grown from a seed to make sure that the Red Mangrove can adapt to the individual conditions like fluctuating temperatures or daylight hours from first day on. To support the growth during the whole year the temperature can be supported by a heating system and the daylight hours by artificial lights to make sure that the Rhizophora mangle receives 10 to 12 hours light daily. Rhizophora mangle plants are available on our webshop. Rhizophora mangle seeds are available on our webshop. Rhizophora mangle develops the for Rhizophora species typical stilt roots or prop roots. 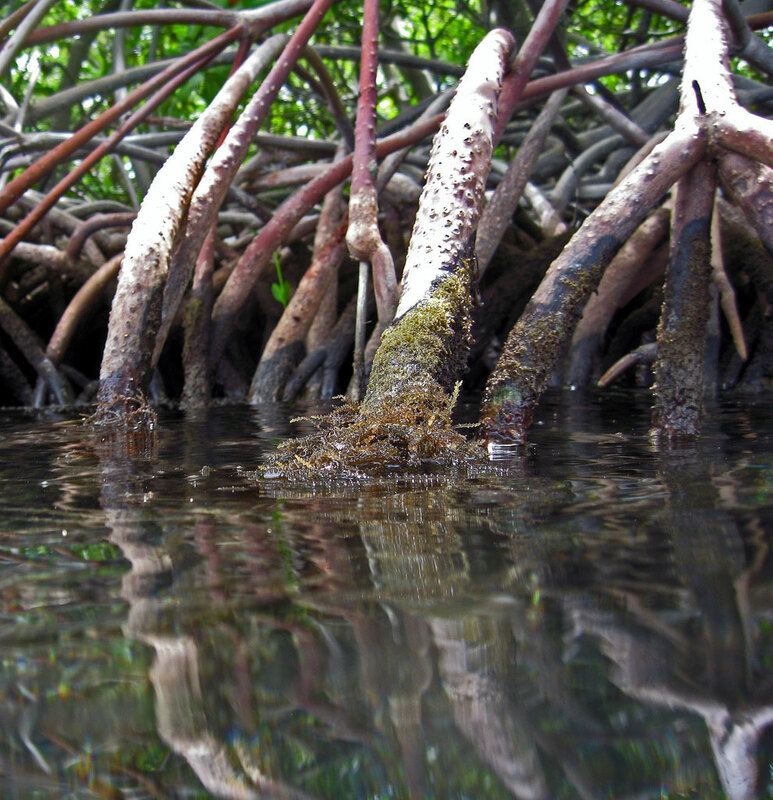 Stilt roots arises from the trunk or branches of the mangrove and grows toward the soil where the stilt root will develop an underground root system. 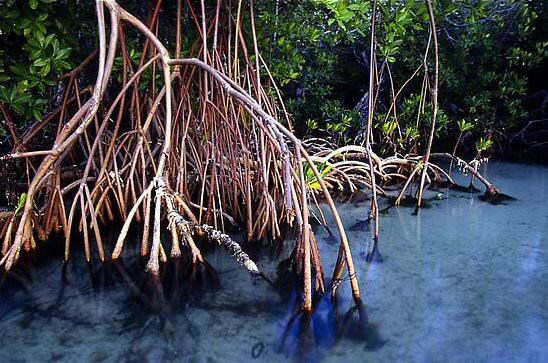 If the stilt root hits water instead of soil the stilt root will grow underwater toward the soil in the ocean or any other subject, a reef for example, that the stilt root can hold on to and be rooted to. Once the tip of the stilt root meets a subject it can root to many smaller roots develop to anchor themselves to the subject or in the soil. To ensure living in the tides it is important for Rhizophora mangle to develop numerous massive stilt roots. Another important ability of stilt roots is to allow the exchange of gas in oxygen-poor sediments. 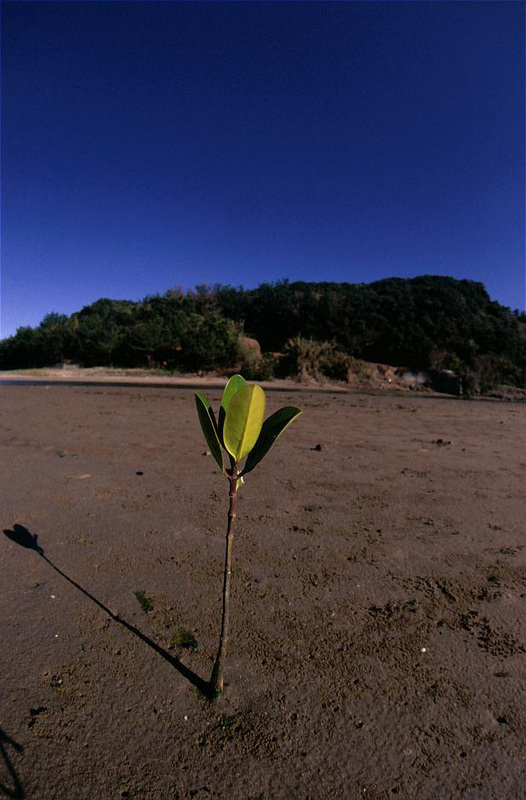 Mangroves do often grow in mud which do almost not supply any oxygen at all. The arcuate stilt roots have countless lenticels which serve the gas exchange. Therefore the common name air roots. Stilt roots of a fully grown Rhizophora mangle can be 5 meters long and extend in a radius of approximately 10 meters around the trunk. Normally young Rhizophora mangle develop their first stilt roots with the age of 2 years. 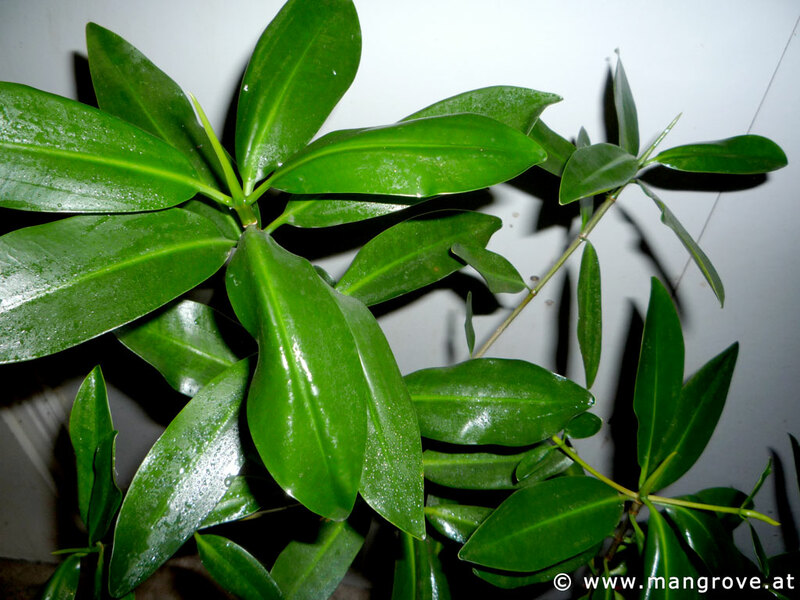 Rhizophora mangle is as any other mangrove an evergreen plant. 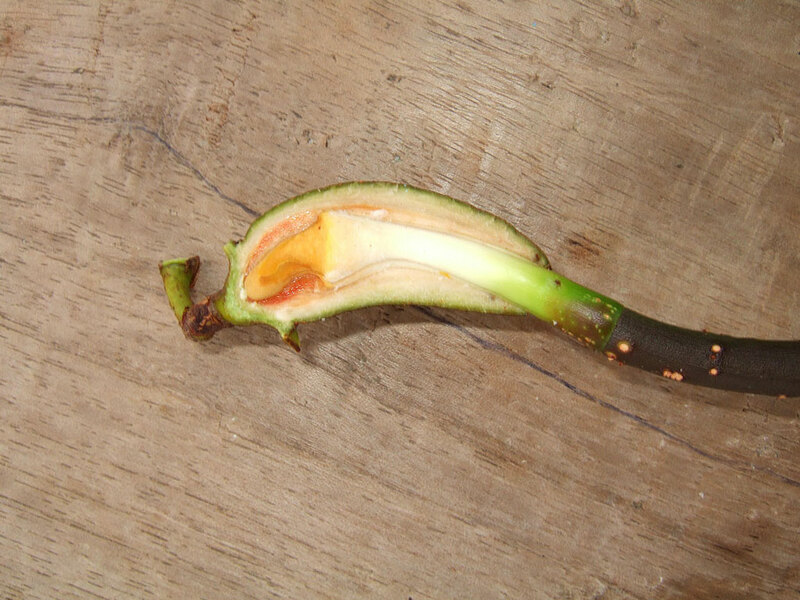 Rhizophora species grow leaves in clusters at the end of branches, pollutants and excess salt in the cell sap are placed in older leaves which turn yellow and fall off. 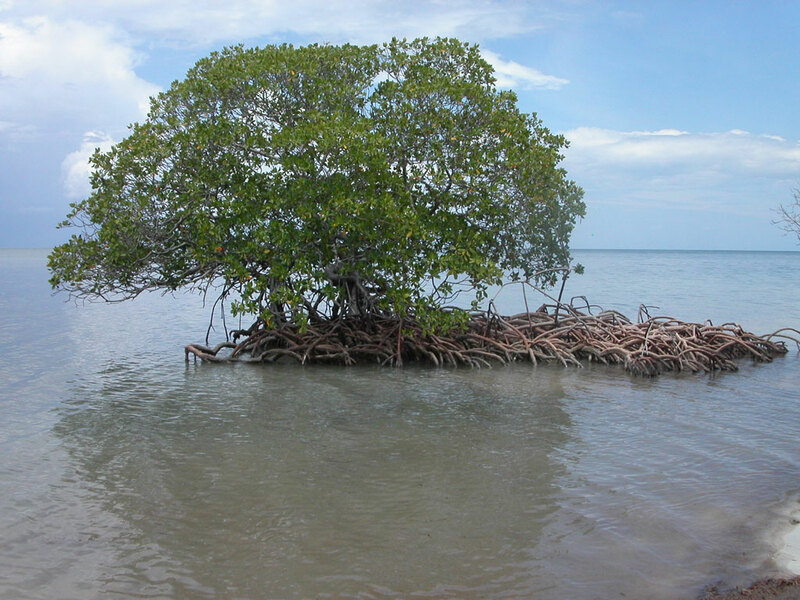 The Red Mangroves normally grows along the equator in a habitat with tropical and subtropical climate therefore Rhizophora mangle is an evergreen tree that develops branches and leaves during the whole year. 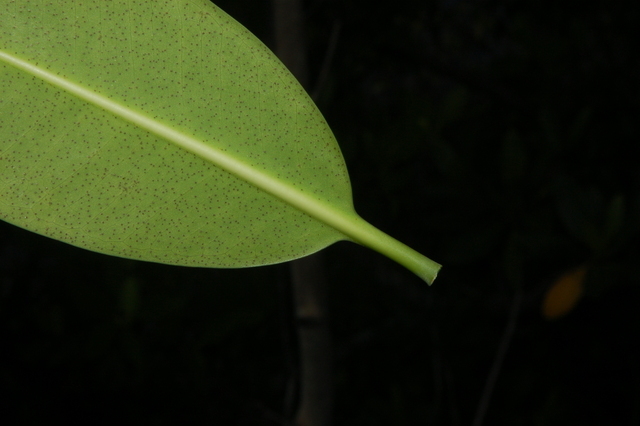 The leaves are generally oppsosite and have an elliptic shape, the upper side is smooth and dark green the bottom is waxy and light green to yellowish with black spots. 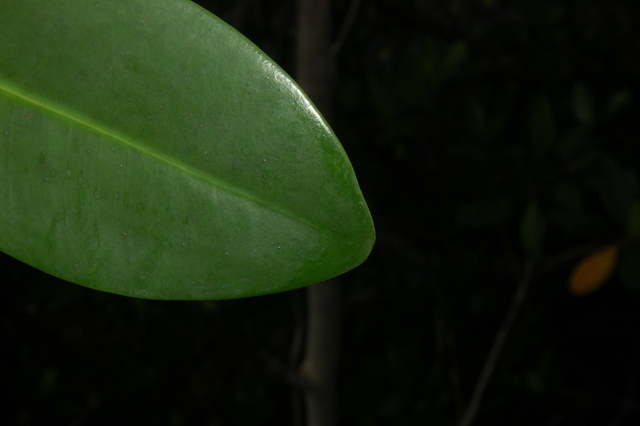 The Red Mangrove has thick and leathery leaves which are up to 15cm, most of the time between 6 to 12cm and about 3 to 6cm wide. 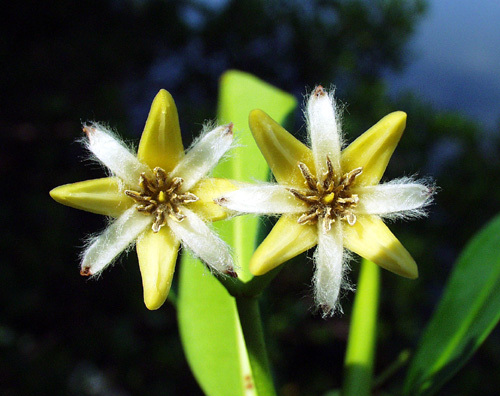 The blossoms of Rhizophora mangle are small and inconspicuous as all blossoms of all Rhizophora species. The colors of the blossoms are usually white and yellow which car vary from pale yellow to dark yellow. Rhizophora mangle develops compound inflorescence, the flowers arise from the axil. 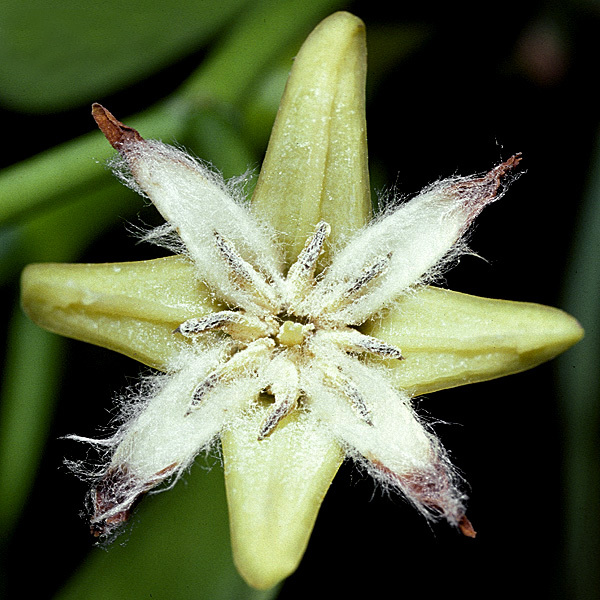 Flowering of Rhizophora mangle varies by location. 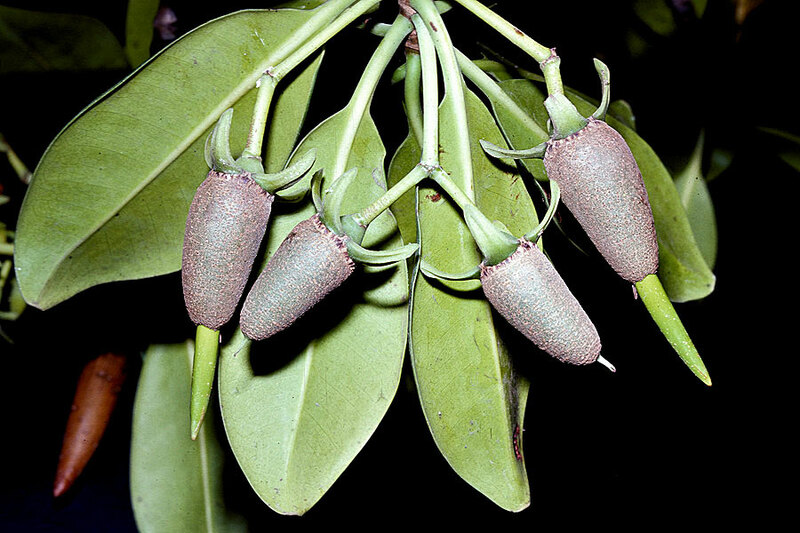 Rhizophora mangle develops little brown fruits which are about 3-5cm small. A propagule vertically outgrows the fruit. 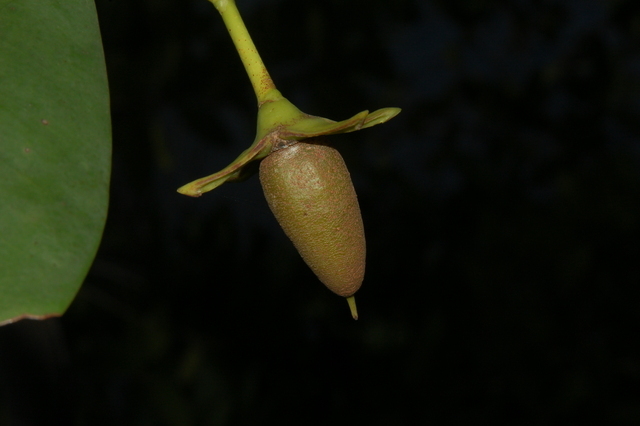 The propagule starts to grow its sprout in the fruit while it is still on the mother tree. Propagules of Rhizophora mangle are easy to identify for beginners as they are brown at the lower third of the propagule. 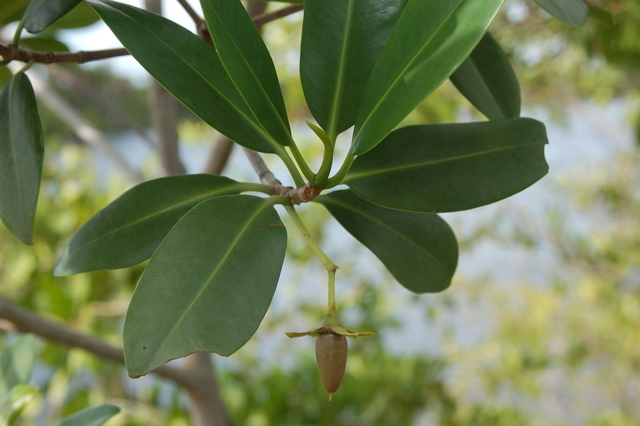 As most mangrove propagules the propagules of Rhizophora mangle are viviparous and already develop a sprout on the mother tree. Rhizophora mangle normally develops propagules twice a year, the time when Rhizophora mangle develops them varies depending on the location. Fresh propagules vary from dark green to light green and sometimes even with some reddish and brownish but there is one thing that all propagules of Rhizophora mangle have in common, the brown colored lower third which sometimes even seems to be a little woody. 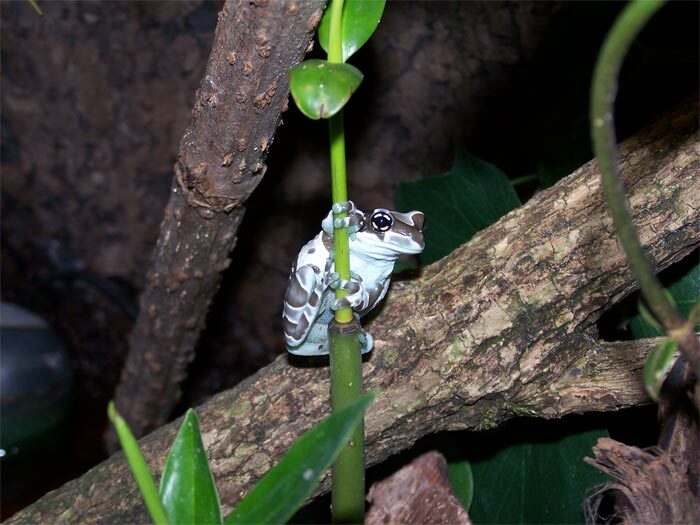 The viviparous propagules can grow up to 40cm in lengh but most of the time do not exceed a lengh of 20 to 30cm and a diameter of 1 to 2cm. This characteristic allowed Rhizophora manlge to conquer the US, Central America, South America the Caribbean Islands as well as West Africa. Typically Rhizophora mangle develops a one columnar stem which often soon starts to develop a few main branches. The wood of the trunk has a high densite which makes it very attractive for industrial, more details about the usage of Rhizophora mangle can be found at "usage". 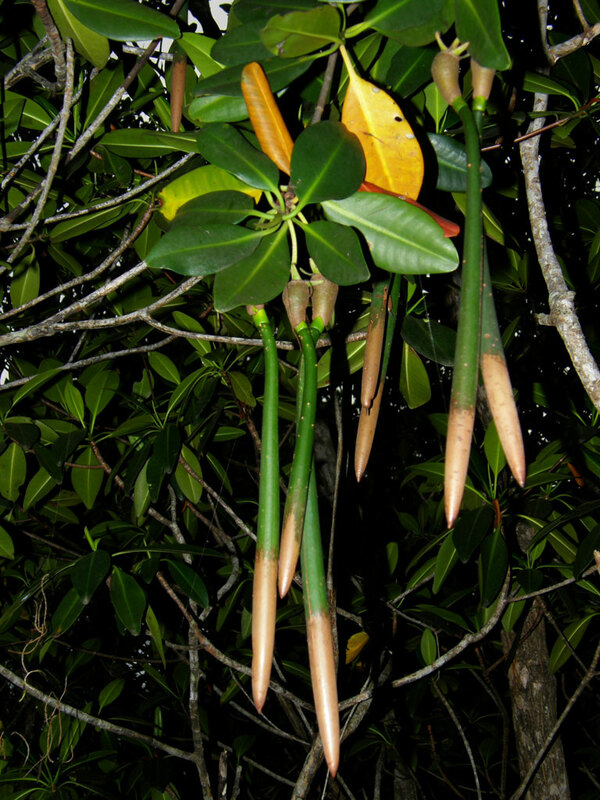 During the live of a Rhizophora mangle tree the stem can reach a diameter of 20 to 50cm. The bark is greyish to brownish, thin when young and thick when older. Rhizophora mangle is tolerant to the substrate in which it grows as long as it is very nutritious and does not have much humus. Rhizophora mangle prefers muddy, oxygen-poor soils along estuarine banks or along the coast. These muddy soils are flooded daily by the tides and are mostly inhabited by numerous crustaceans which decompose biomass such as falling leaves and blossoms quickly. Rhizophora mangle grows along the coast and sometimes directly in the ocean near the coast, often in areas where rivers flow into the ocean, soils are very nutritious and where humidity is between 60 to 80 percent and the air temperature is between 25 to 30°C. Under these conditions Rhizophora mangle is able to reach a height of up to 35 meters but usually stops between 10 to 20 meters. 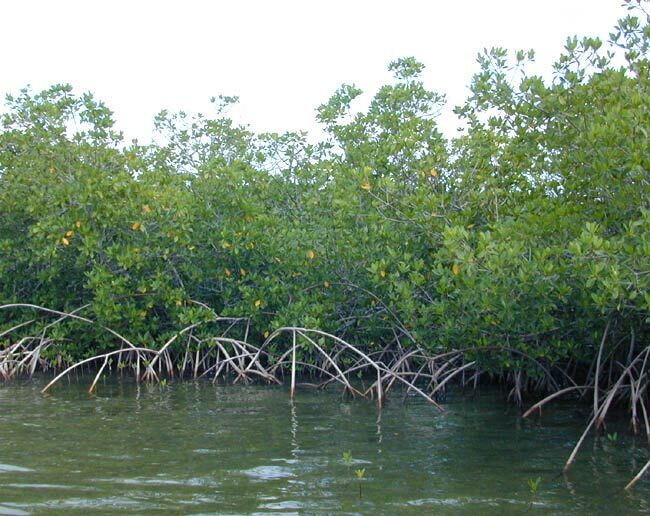 The height and growth of the Red Mangrove is in direct relation with the location where it grows and the existing growth conditions. This is why dwarfts of Rhizophora mangle are found in the very north and south of its habitat where the climate is colder and the daily sunlight hours vary in winter and summer while Rhizophora mangle near the equator can reach more than 30 meters in height. Young plants develop the first branches already after a few pair of leaves and immediately grow in width. This is another feature of Rhizophora mangle to defend its position. 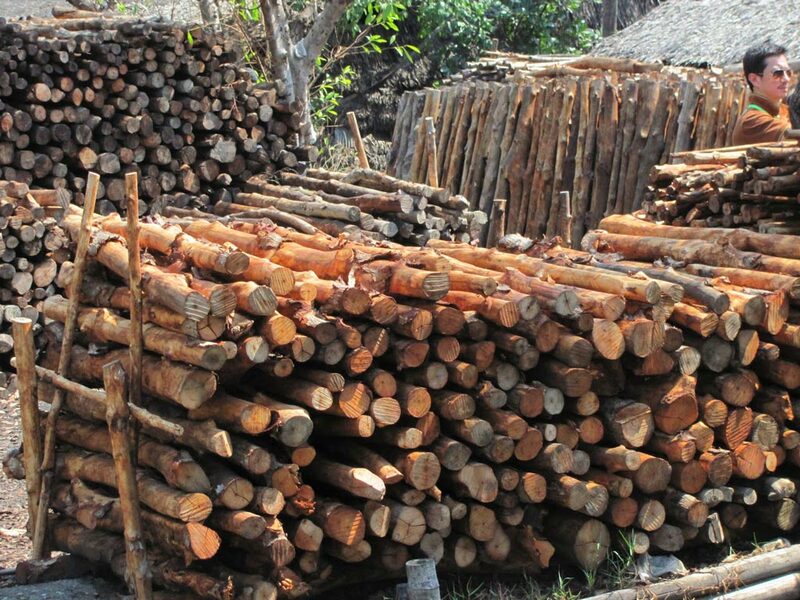 The wood of Rhizophora mangle has very high density and therefore very heavy wood which makes it very attractive as timber for boats, houses, fences and also fire wood. Rhizophora mangle is still used nowadays to produce charcoal. 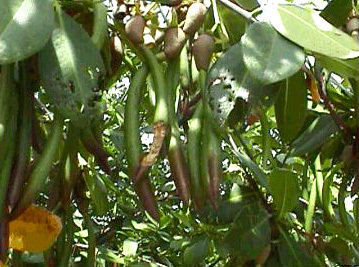 The tannins of Rhizophora mangle are used for dyeing leather. 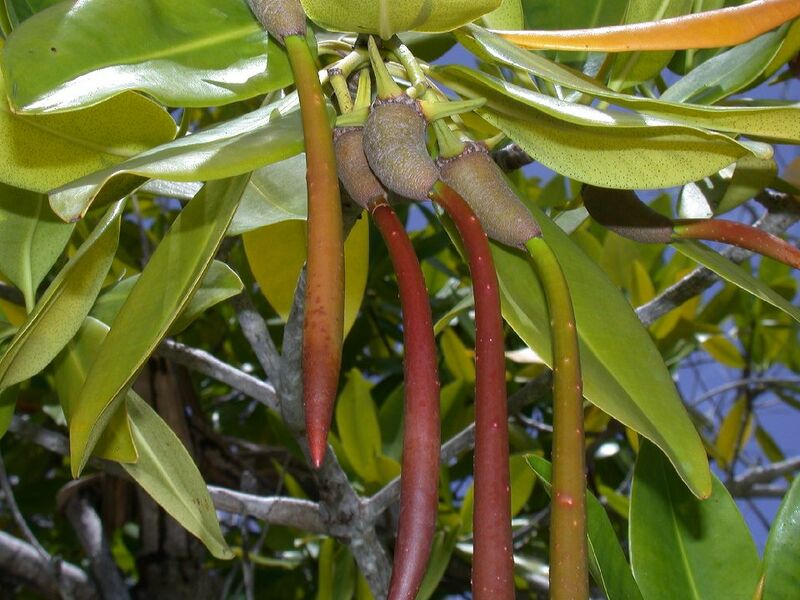 An extract from the bark of Rhizophora mangle is obtained to reliably help against stomach ulcers. 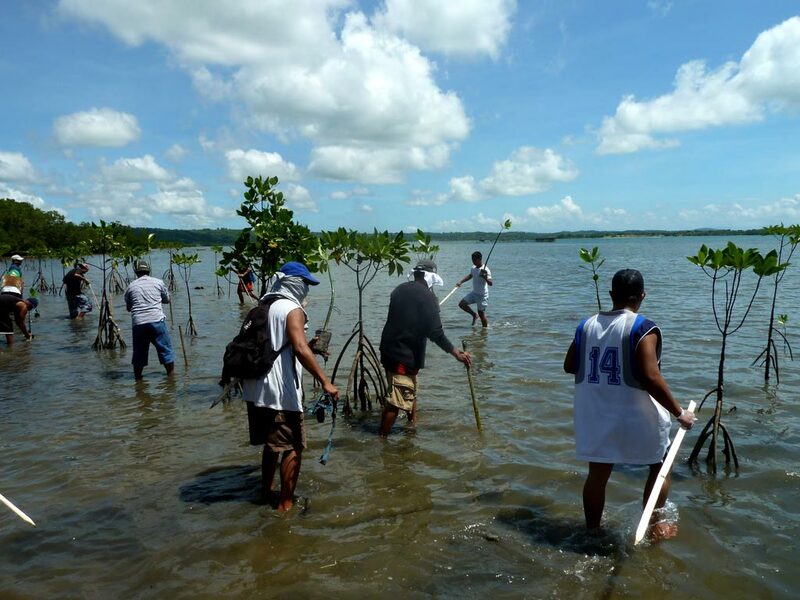 Fortunately, people use Rhizophora mangle mainly for reforestation of destroyed coastlines as Rhizophora mangle grows quickly and reliably protects coasts from erosion. Rhizophora mangle furthermore helps fisherman and aquaculture by providing perfect breeding habitants through its root system for countless fish and crabs.